St. Jean-Le-Thomas France: Not Published, 1937. 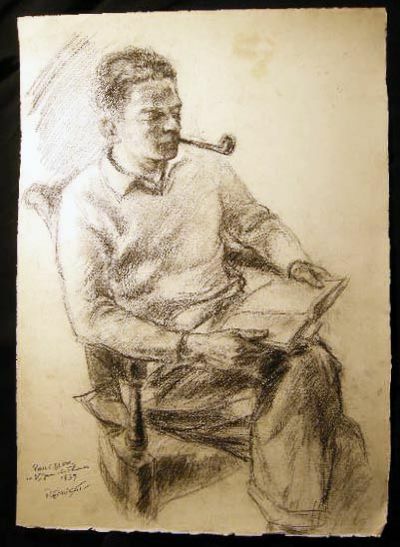 Original charcoal seated ¾ length portrait, inscribed to the sitter "Paul C. Blum in St. Jean-le-Thomas 1937 (signed) Remusat" by Claude Remusat (1896-1982) French artist, decorated World War I veteran and close friend of American Paul C. Blum (1898 - 1981), Yale graduate, who was engaged in espionage activities for the United States via the OSS and the subject of the 1998 biography "Blum - San! Scholar, Soldier, Gentleman, Spy" by his nephew Robert S. Greene (1922-2013) American writer, jazz musician, documentarian and historian. Approx. 15" x 20 ¾" size; accomplished on heavy, good quality Rives watermark paper; some smudging, spotting to the image & background; in very good condition. (With) a 1981 black marker on paper of the backstage area of the Ballet "coulisses" signed and inscribed "For Paul C.B. Bonne Annee 1981 de tout coeur - as ever," 12" x 14 ¾" ; and a pencil sketch head portrait of Bob Greene , signed "Remusat - for Bob Greene Paris 23 Dec 1980" 9" x 14" on plain paper (little spot below signature) and with a paper window-overlay; and an ink on paper drawing of dancers, inscribed "Remusat - To Bob Greene affectionally Xmas eve 1980 Paris" 11 ¾" x 14 ¾". (With) 6 black and white photographic prints of Remusat portraiture: Paul C. Blum, Shostakovich, Khachaturian, Ruggero-Gerlin, Hindemith, Alfred Cortot. Also with a photograph of Remusat's house in St. Jean-le-Thomas taken in 2007 and two portraits of the artist, both mounted in frames, one taken from a periodical and the other a digital image, now degraded to yellow-green tones. With the 1994 catalog of Remusat's works "Les Americains dans l'Avranchin" French & English text, 1994 commentary on the works and times, with biography of the artist; (24) pages, oblong format, color illustrated, light wear and in very good condition. The Yale Guide to the Paul Charles Blum Papers (MS 900) state that Blum "